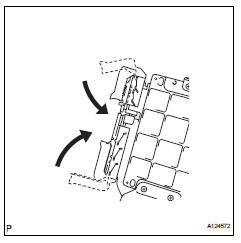 Install the 2 brackets to the ecm with the 4 screws. Connect the 2 ecm connectors. When connecting the connector, make sure that dirt, water and other foreign matter does not become stuck between the connector and other part. Connect the 2 ecm connectors and lower the 2 levers. Make sure that the 2 levers are securely lowered. Install the ecm with the 3 bolts. 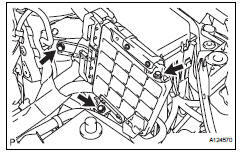 Install the air cleaner case with the 3 bolts. 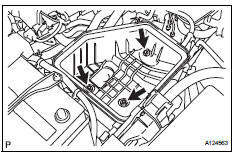 When replacing the ecm, the vehicle identification number (vin) must be input into the replacement ecm (see page es-13). 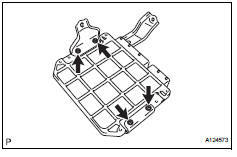 When replacing the ecm, perform the vehicle stability control system recognition in the ecm (see page cc-12). When replacing the ecm, perform the reset memory procedure (a/t initialization) (see page ax-18).